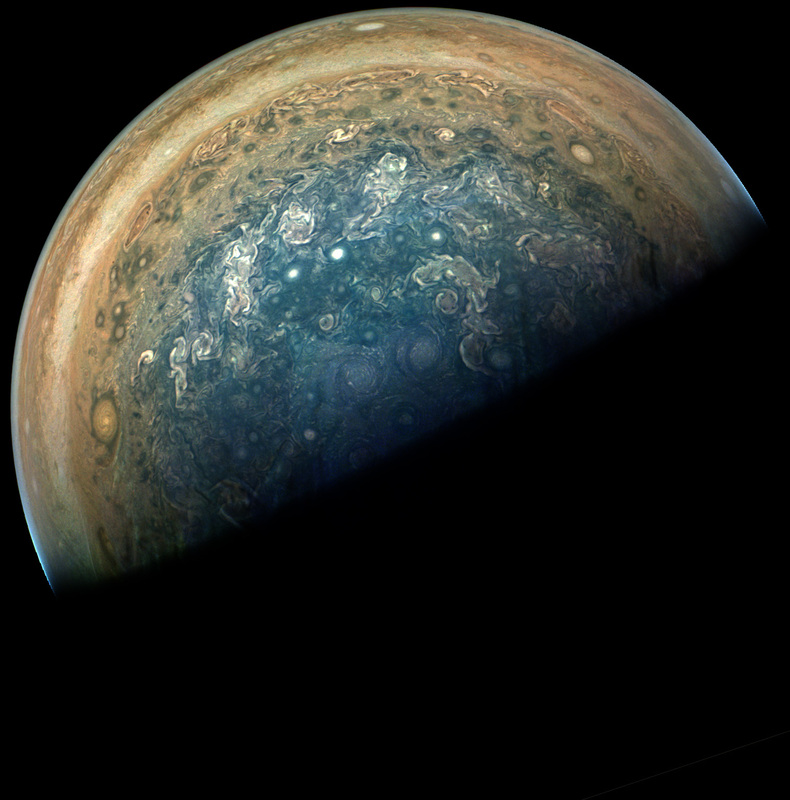 Michael Ravine, Advanced Projects Manager at Malin Space Science Systems, Inc., has kindly agreed to share this fascinating post about how he and his team translate black and white images from JunoCam on the Juno Jupiter Orbiter into color images. 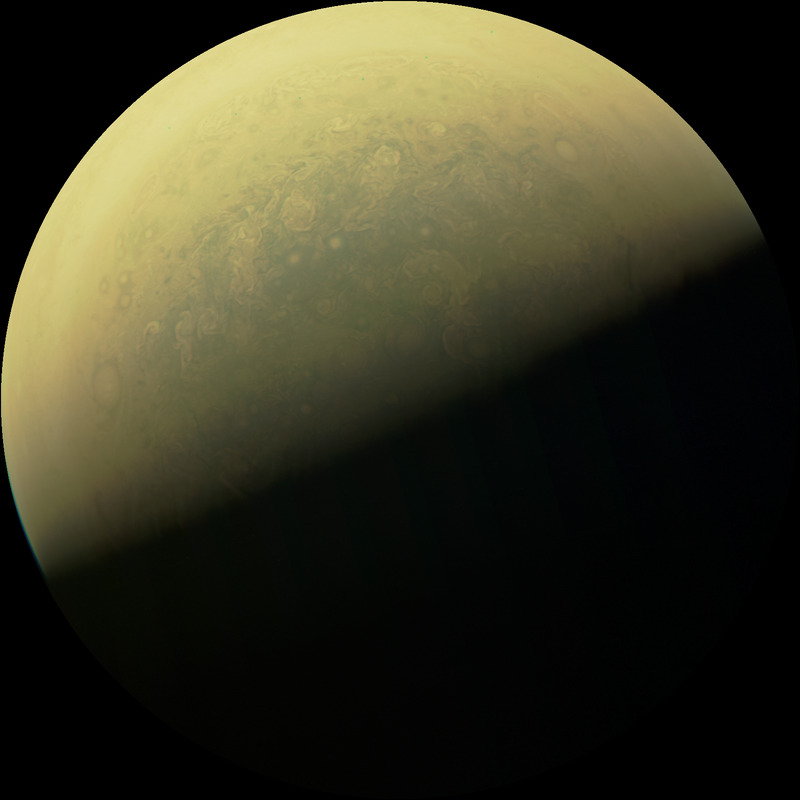 This is an attempt to summarize the main points of making images from Junocam. The images available there include the raw “Venetian blind” images like the one above, and various processed versions, include some done by a number of interested amateurs who’ve made a real contribution to getting the most out of the camera. You might think this last step is a bit dishonest, but I would argue that’s a matter of interpretation. If you were actually there, you wouldn’t be taking a single picture of all of Jupiter with your eyes, you’d be building up an image in your mind by scanning your eye all over the disk. When you looked at the South Pole, you pupils would dilate and let in more light so you’d be able to see the details of the circumpolar cyclones. And when you looked and the limb, which is much, much brighter, your pupil would stop down, letting in less light so you would get a clearer impression of the lower latitude belt-and-zone banding. And you might wonder, why such a goofy way to take pictures? It made sense at the time, but that’s another story (there is some of this background in the paper linked above). And if you make it out that way, you’ll have to let me know if I was right about the colors.